It was not the best of weathers for Longborough, especially for those hardy souls who were determined to picnic in the open air, and in a way the production inside the opera house seemed to mirror the grey clouds outside it. For instead of delighting us with bewigged 18th century characters dressed in colourful satin outfits director Thomas Guthrie updated the action to the post-Edwardian period when fashions were somewhat dowdy: in the spirit of the time Cherubino goes off to his regiment clad not in a smart scarlet uniform, but in khaki. There is an air of resentment and suspicion throughout the production. Figaro resents being a servant to an employer who is not one jot better than he is. The Count resents Figaro for landing the woman of his desires and conspires with Basilio and Marcellina to get even with him and prevent the marriage. The savvy Susanna distrusts the Count recognising that his enlightened policy to abolish the droit de seigneur is more superficial than real, and gives her husband to be a real bashing when she discovers him embracing Marcellina – who is not her rival, in fact, but his mother. In an opera buffa these traits are normally treated in a light-hearted fashion, but when the action is brought closer to your own time you begin to take them more seriously. Despite the many flashes of humour I had moments of unease. Once again Longborough Opera has assembled a cast of excellent singers who assume the character of the roles they play to perfection. Benjamin Bevan is a brute of an aristocrat consumed with lust rather than love, who manages to inspire our loathing almost to the end when he receives his comeuppance. But what a voice he has! Susanna Fairbairn is everything one expects the Countess to be, sad that her best years seem to be behind her, singing wistfully of bygone pleasures in “Dove sono”. And Anne Harvey as Cherubino comes over as a particularly gauche adolescent unable to keep his passions under control and managing hilariously to be forever in the wrong place at the wrong time. Australian Grant Doyle fits the role of Figaro like a glove. Unlike his bride-to-be he is slow on the uptake unable to see any problems in being quartered next to the Almavivas. But on learning how easy it will be for the Count to access his beloved his fury boils over, and this is not the only time in the opera that he exposes his feelings with such intensity. Norwegian Beate Mordal is a splendid Susanna, a blonde bombshell with a terrific voice who is the mistress of every situation she encounters. The minor characters were well acted, especially Marcellina played by New Zealander Wendy Dawn Thompson. One also appreciated the efforts of the ten strong chorus who appeared more numerous than they really were. Since Longborough lacks elaborate stage machinery it relies on minimalist, but effective, sets. While the first two acts were very much at the minimalist end of the spectrum, Rhiannon Newman Brown’s orangerie in Act 3 was in a different class entirely and transformed itself seamlessly into the garden scene of Act 4, where Wayne Dowdeswell’s atmospheric lighting came into its own. 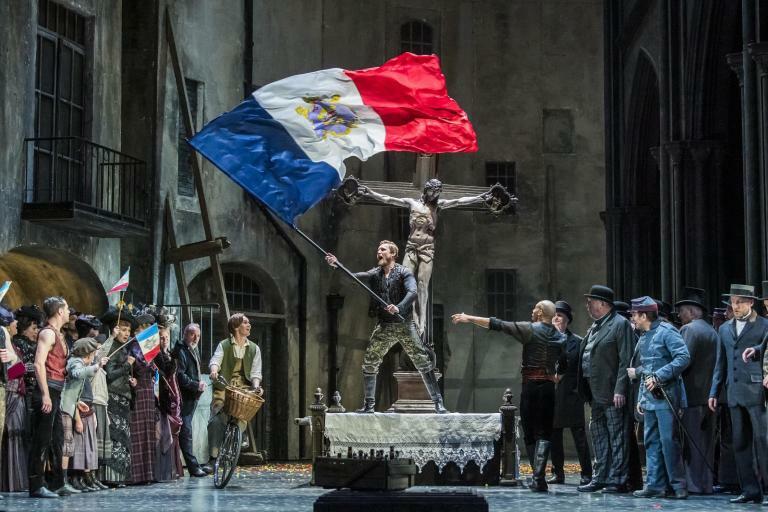 Dutch conductor Robert Houssart – Longborough prides itself on its cosmopolitanism – brought his musical energy and flair to the production aided and abetted by a 34 piece orchestra. Over the years Longborough has mounted a number of productions of Figaro, normally in a more traditional 18th century guise. This has to be one of the more thought-provoking versions I have seen – Mozart speaking to the world of today. For more about opera at Longborough visit their website https://lfo.org.uk/.